Golf explosions are an awful reality of an otherwise beautiful game. To close out the year, we’ve rounded up the saddest golf explosions of 2016 in the hopes that we can all begin to heal. 1. February 14 - Phil Mickelson suffers a devastating golf explosion for birdie: Few fans will soon forget the golf explosion that allowed Phil Mickelson to drop to 3-under on the fifth at Pebble Beach, in one of the most disturbing golf explosions in recent memory. Providing enough concussive force to guide in his 20-foot putt and injure seven, the blast marred an otherwise sublime performance by Mickelson, who has been battling injury all season. Mickelson would later refuse to acknowledge the birdie, out of respect for the victims. 2. April 10 - A golf explosion knocks Jordan Spieth’s caddy into the water hazard on 16 at Augusta: This horrible blast knocked Spieth’s longtime caddy into the water as he approached the green, and sadly, the weight of the clubs prevented him from staying afloat. Although Jordan made a valiant effort to save him, a series of smaller golf explosions along the way prevented the fifth-ranked golfer in the world from making it to his friend in time. For millions of viewers, the image of his caddy succumbing to the water hazard, a pitching wedge still clutched in his left hand, is forever burned into our collective memory. 3. June 6 - Five groundskeepers at St. Andrews are injured while attempting to induce a controlled golf explosion: No one deserves a golf explosion, but when innocent groundskeepers suffer, it is especially awful. Though the circumstances surrounding the incident are still under investigation, it’s clear something went terribly wrong in this attempt to induce a golf explosion in a safe, controlled environment. Five groundskeepers were hurt in their efforts to keep the course safe for everyone, and the event has given a somber air to the course ever since. 4. July 19 - Astronomers observe a 7.8-magnitude golf explosion near the Orion Nebula: The event was confirmed by scientists around the globe who were able to record this breathtaking phenomenon via high-resolution cameras. 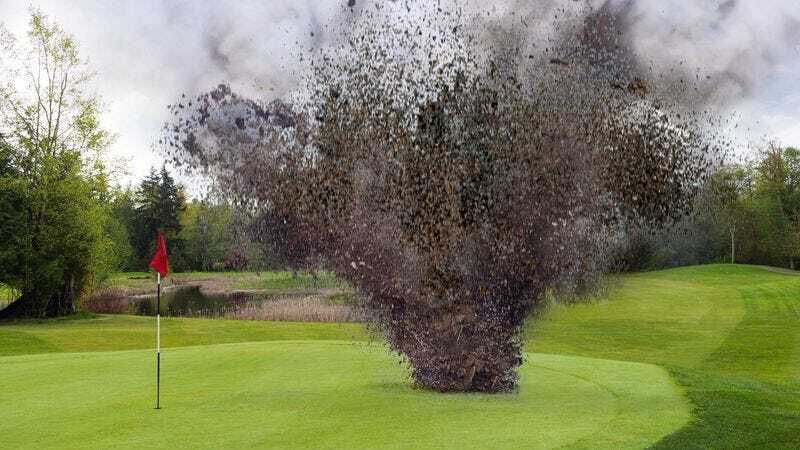 Registering at an unthinkable 7.8, scientists estimate that this golf explosion over 1,000 light-years from Earth had the power to destroy over 500,000 square miles of lush fairway and fundamentally alter golf as we understand it on any planet unlucky enough to be in the blast radius. We can only hope planet Earth is not due for a golf explosion of that size any time soon. 5. August 29 - A golf explosion destroys the buffet at the U.S. Open: Tragically, we’ll never know what would have been. Minutes before the buffet was set to open to hundreds of hungry golfers, a golf explosion destroyed all remnants of the food, which had been painstakingly prepared by the catering staff at Oakmont. For many amateur golfers who qualified for the event, this would have been their only chance to try a real, honest-to-God PGA Tour breakfast buffet. 6. October 2 - The Ryder Cup is canceled after golf explosions occurred every time someone hit it into the sand trap: Though officials were able to overlook it initially, after the first four shots into a sand trap each triggered a golf explosion, it became clear that it was unsafe to continue the tournament until the situation was remedied. The course was ultimately reopened once they were able to replace the sand traps with ones that did not have such a clear causal link to golf explosions, but not before golf fans were robbed of one of the most exciting tournaments in the sport.